Stacey began learning the Bassoon aged 9 at the Dorset Rural Music School with Tess Maybury, but until the age of 17 Stacey mainly played the Viola, learning with Alison Kay. 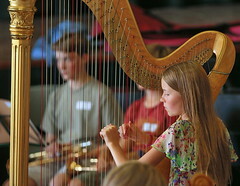 As a child Stacey played in Dorset Music Service ensembles and local amateur orchestras such as the Shaftesbury Orchestra, and spent 4 years in the National Children’s Orchestra, before moving on to the Wessex Youth Orchestra, and the National Youth Orchestra 2013. Switching focus to Bassoon, Stacey started at the Junior Royal Academy of Music during Sixth Form, studying Bassoon with Pete Harrison, and in September 2015 commenced her undergraduate degree at the Guildhall School of Music and Drama with the help of a Guildhall Trust Scholarship, studying under Daniel Jemison. Stacey still enjoys playing the Viola as her Second study, learning with German Clavijo, and has recently taken up Baroque Bassoon lessons with Pete Whelan. Stacey has performed concertos locally with the Dorset County Orchestra, Shaftesbury Orchestra, and the Wimborne Chamber Orchestra, and in London with the Junior Academy Sinfonietta.